My brother and I are having issues with Field 2 and what is apparently ground noise (constant low level grunting). So much so that I have to find a clean spot for ground balancing in Field 1 and then switch to Field 2 to balance. I am assuming that our soil here in Mississippi is mild. On our last hunt I was running sensitivity of 20, Iron Bias 0, and a recovery speed of 3. The site is not overload with trash and iron. In "all metal" we are getting constant grunting. Switching to Field 1 clears the background noise up and allows us to hear just the iron. Is there anything we can do to reduce the ground noise in Field 2? First of all, need to know if you are running an 800 or 600. Recovery speed of 3 on the 800 is pretty low and may introduce ground noise, however in the 600, recovery speed is max. Ground noise usually manifests as unstable -9 to -6 readings. Is that what you are observing? Also, the default for field 1 is 2-tone = low tone for ferrous and high tone for everything else. However, for field 2, tone default is 50 tones which means you will get lower pitch tones even for non-ferrous conductors. Unless you are clearly swinging over a ferrous target (repeatable mid to low negative numbers i.e., -5 to 0) do not worry so much about finding a silent spot to GB. (If you have default disc cut in you wouldn't know anyway, unless the auto GB failed because a target was actually under the coil). The different frequency profiles between Field 1 and 2 will mean they will react to the ground differently and resilt in different levels of ground noise for the same default GB setting. Regardless, after a sat GB in any mode the ground noise should abate unless there is a significant change in ground phase over short distances (which is typically the case in mineralized ground) or you have changed settings that can increase ground noise, such as lowering recovery speed or are running with very high levels of sensitivity. If you find yourself having to frequently rebalance to get rid of ground noise, you might want to consider using tracking GB. Every region of the country can have areas of high mineralization. Problem is, Equinox doesn't have a mineralization meter so you have no direct indication of ground mineralization and cannot infer mineralization solely from the displayed Equinox GB number. 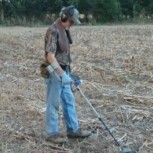 You need a detector with a mineralization meter, a geologist, or anecdotal evidence from other detectorists who frequent the same area to know if the sites you are detecting are mild or hot. I am running an 800 and my brother a 600. My brother was running his 600 as follows: Recovery 2 and was using 5 tones (as I was also), very thing else was factory settings. My brother was also getting falsing on the ends of his swing. We started off running hot because the site has been hammered for 30 years and we were hoping to find deep missed targets. After about of hour we reduced back down to a sensitivity setting of 20. I also rebalanced several times during the hunt. My solution was just to turn off the iron (horseshoe) and not hear all of the discriminated tones. The soil is Loess and I have no idea as to its mineralization, but I am getting a XP ORX in this week and I will then be able to check. Thanks for the long and helpful comment. ORX should give you a good idea of mineralization level. Suggest run tracking GB in high mineralization or highly variable ground phase conditions. Two additional suggestions, (1) try running All Metal only when you need to interrogate a target, (2) use the threshold feature to allow you to "hear" the threshold dropouts associated with discriminated iron during normal ground scanning, that alternative approach really helps counter the ear fatigue that is common when otherwise operating solely in AM. HTH. Thanks Chase. We will give your kind suggestions a try. Ground noise shows up in the Park and Field 2 Modes a lot more then the 1 modes. Run 50 Tones and setup your iron range volume real low and the puttering shouldn’t bother you. If so, notch out a few of the lowest numbers like -6 through -9. That way you can still hear most of the iron. Lowering ferrous volume is a good approach if you want to run AM continuously. Though, unless I am reading the manual wrong (I don’t typically go in and mess with custom tone settings), I don’t think you can notch out individual TIDs within the ferrous discrimination range, you have to change the ferrous/non-ferrous breakpoint from 2 to -6, but then you will be hearing anything above -6 all the time (even with all metal off) and it will have a non-ferrous tone in 50-tone based on the ferrous/lowest non-ferrous tone delta setting. Just a consideration if you choose to go down that route. I think lowering iron range volume is your best bet. If you run in 50 Tones you can notch out any number including those within ferrous range.